Amber Heard has accused “mean-spirited” Johnny Depp of punishing her by deliberately delaying their divorce proceedings. The couple split up last year but their public dispute over the legal particularities of their divorce is still on going. Although the couple settled their divorce back in August, Amber Heard claims that Johnny Depp has not lived up to his obligation to her under the settlement and is intentionally dragging out the court case. Amber`s attorney says that Mr. Depp`s prolongation is nothing more than a way to perpetuate his feud with Heard and is a waste of Courts resources. The actress, who previously accused her husband for domestic violence, now officially requested for the legal process to be sped up. The divorce had been settled in August, when Johnny agreed to a $7 million settlement, which Amber requested be donated to the American Civil Liberties Union and Children’s Hospital Of Los Angeles. However, last week Amber’s legal team filed a Request For Order with the Los Angeles Superior Court in hopes of imposing the settlement and expediting Johnny’s payment. “I want my life back. I want to be divorced from Johnny now”, said Heard. It sure sounds like Amber is putting her donations to American Civil Liberties Union and Children’s Hospital Of Los Angeles first, right? Although Depp has been rather silent about the whole shebang, he did imply that the previously mentioned Request for Order is unnecessary unless it suited the purposes of grabbing the media attention. However, Amber still claims she filed the request only because she wants to get over with this ordeal as soon as possible. “I have been committed to a quick resolution of this matter so that I can be divorced from (Depp),” Amber said. What do you think are her main goals here? Donations? Money? Freedom? Or media attention? Johnny Depp Ties The Knot, Marries Amber Heard Beach Wedding For Johnny Depp and Amber Heard Amber Heard Describes Her Marriage To Johnny Depp Elvis’s Granddaughter Riley Keough Marries! 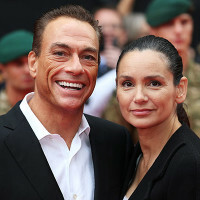 Van Damme Divorces Wife For the Second Time Keira Knightley Becomes A Mom!